• exploitation, predominantly for forced labour in the construction, agriculture and domestic sectors as well as for begging, prostitution and various forms of sexual exploitation. It is the exploitative purpose that is at the core of trafficking and distinguishes it from other crimes. 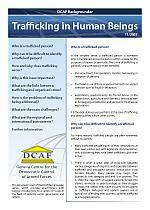 What is a trafficked person? Why can it be difficult to identify a trafficked person? How and why does trafficking occur? What are the links between trafficking and organised crime? How is the problem of trafficking being addressed? What are the regional and international instruments?